Nine players turned up so TD Nick declared a three man Ambrose with three drives requires from each player. After a bit of correction of a handicap, Teams 1 and 2 drew while Nick's Team 3 quickly acknowledged defeat and paid for coffee. Two balls in and so each player in Teams 1 and 2 won three balls while losing a shot. Club rules will apply in that over 65 yo’s can hit from the black tees on those holes that have them (2, 3, 5, 12, 13 or 16) whereby you will be playing your second shot off the tee. In addition, on the 12th, the usual SMERGS rule will apply in that after a shot into the gully you can play your third from the visitor’s tee (which is next to the black tee). NTP on 17, Longest drive on 18. Will do my best to break ties, if any (probably back 9 for overall, last three holes for each of the front/back 9 hole prizes). There were some great scores. Breaking the many ties caused the TD (under considerable duress) to revert to some very tricky and uncheckable mathematics (applying Boyle's law and the Hilbert Principle) to decide the overall and front 9/back 9 winners. The TD then proceeded to stuff up the simple team average (applying 5th class mathematics) to unfairly make Team 1 pay for coffee when in fact they won, or was that penance for their slow play?. Congratulations to Ken Miller for wearing the jacket for yet another year and to all the other winners. T'was a mild, misty and muggy day with very little wind - benign conditions for St Micks. TD Ricky B ramped up our handicaps before adjusting for slope to give everyone a chance. 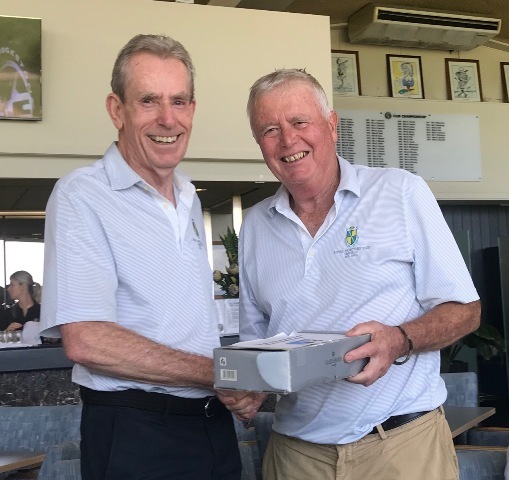 Rick held back a little in calculating his own handicap but nevertheless won the day with 35 points from Burnsie on 34 who took out the back nine. Gazza won the front nine. Rick's win takes his handicap to +1 which means everyone adds ten strokes to their handicaps for next Sunday. 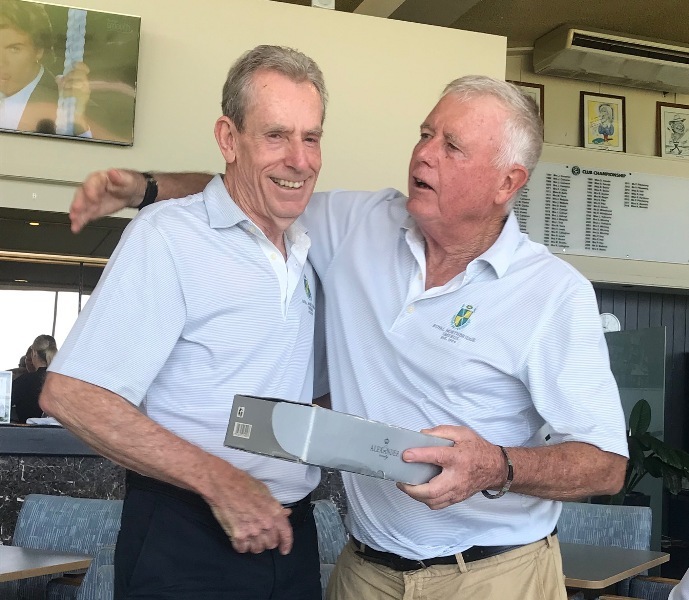 Rob got excited when he was the only one in Team 1 to sit on the longest drive 9th fairway but it didn't last long as he was eclipsed by Rick in Team 2 who was then eclipsed by Wadds in Team 3. Thornto was nearest the pin on the 3rd where he didn't have much competition! The teams event was calculated by multiplying the best three scores on every hole which clearly favoured Team 2 by a country mile. No gimmees were allowed. The course was in excellent condition and thanks as always to TD and long term St Micks member, Ricky B.